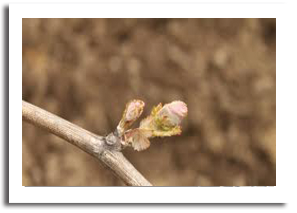 WHAT’S GOING ON IN THE VINEYARD IN SEPTEMBER: Bud Burst! Pruning is finished. When the mean daily temperature reaches 10 degrees Celsius, the buds burst, becoming shoots bearing new leaves and bunches of grape flowers, starting a new generation in the grape vines. Chardonnay bursts first, followed by the other white varieties then the reds. Spray programmes have been implemented in the vineyard to assist with bud burst and to control pest and disease. The most commonly used product is sulphur, and also copper, two natural elements used extensively in vineyard management, including organic producers. WHAT’S GOING ON IN THE WINERY IN SEPTEMBER: Spring Racking Programme ! General maintenance of wines continues. After the quiet winter months many wineries embark on a “Spring Racking Programme” where all wines are racked from barrel to tank and assessed. The laboratory staff performs pH, TA and SO2 checks and sensory assessment is carried out to evaluate how the wines are developing during their oak maturation. Winemakers will begin to think about what fining wines may need. WHAT’S GOING ON IN THE VINEYARD IN OCTOBER: Growing Furiously! The vines are in a highly active stage of growth. On the shoot of a vine there are new clusters of flowers. One cluster could have hundreds of flowers. Between 5-50% of the flowers become fertilized by the hard work of bees and bear bunches of grapes with 20-200 berries. Shoot thinning is underway, removing unwanted shoots from the vine canopy in order to open the canopy reducing vine disease risk and increasing sun penetration to achieve the desired yield. By the end of October and starting with Chardonnay, canopy wires are lifted to help direct and support the vine growth. WHAT’S GOING ON IN THE WINERY IN OCTOBER: Sharing with the Angels! October follows a similar pattern to September, as all wines are continually assessed for development. Wine production is very labour intensive and racking particularly so. Each barrel must be pulled out of climate controlled storage and laid out using a forklift. Pumps and hoses are set up so a racking spear can be inserted into each 225L barrel (called a barrique), from where the wine is pumped to tank. Once a barrel is empty it is turned over to allow any lees to drain, then is cleaned and drained again. 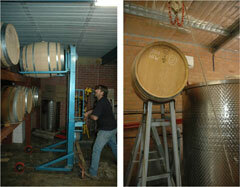 When all the barrels are empty and clean, the wine is assessed in tank, adjustments made, then pumped back to barrels. It is a lot of emptying, filling and cleaning! There are also certain times of the year when assessment and alterations are made to individual barrels. Barrels are also topped throughout the year to ensure they remain full and the wine does not become exposed to oxygen. Even at perfect temperature and humidity some wine will be lost to evaporation and this is known as the “Angel’s Share”. WHAT’S GOING ON IN THE VINEYARD IN NOVEMBER: Flower Power! The shoots grow longer and flowering is on! During the month the flowers begin to form grape berries, an important process referred to as fruit set. The vine is alive with a hive of activity through photosynthesis, where CO2 and water react to form sugar. The main sugars in grapes are glucose and fructose. The energy for this reaction comes from the sun. The water comes from the soil via the roots. 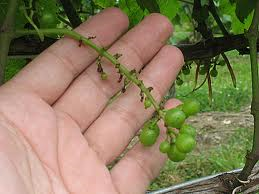 The sugar produced in the leaves is moved through the shoot to other parts of the vine and to the developing berries. This sugar is mainly used for berry growth and chemical reactions within the berry cells. The berries are small, hard and green and are undergoing rapid cell division and growth. Tartaric and malic acids are produced in the berry (but not sugar) during these early stages of berry growth. Canopy wires continue to be lifted to help direct and support the vine growth. WHAT’S GOING ON IN THE WINERY IN NOVEMBER: Observation & Maintenance! Similar schedule to October where wines are regularly assessed for development. At this stage the results of oak selection and ageing choices are becoming clear for many of the reds. A winemaker can choose French or American, new or old, and from a variety of coopers using different forests when deciding on wine style and quality. Oak barrels can cost up to $1750! A tree in France will need to be 100 years old before it is suitable for wine barrel production and one tree will produce only one or two barrels. After careful selection the tree will be felled and split along the grain of the wood before being dried in a kiln or for several years outside before a cooper will begin to construct a barrel. Each stave is hand selected and shaped (no glue is used) and barrels will be fired (for further flavour), referred to as toasting. All wines at Saracen Estates are fermented and/or matured in barrel – chips or staves are not used in our wine production, and this results in a superior quality product.